I don’t care what anybody says, Rocky IV is a classic. Sure, it’s not as iconic as the first film and it’s way more cheesy, but nothing beats the showdown between Sylvester Stallone and Dolph Lundgren in the ring. 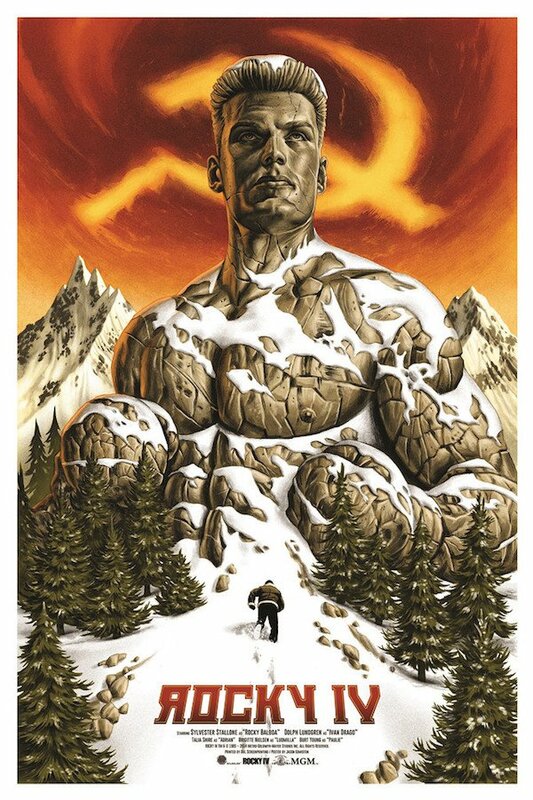 In celebration of the film, the purveyors of "cult decor," Skuzzles, released a limited-edition Rocky IV poster, immortalizing Lundgren as the god-like action star that he is. The folks at /Film were the first to debut this incredible 24x36 inch poster, which was created by Jason Edmiston just for Boxing Day. The print went on sale on December 26 for $50, with a $60 Russian print version. Unfortunately, it’s already sold out, but we couldn’t resist sharing this design, which makes us want to sing of the purple mountain’s majesty. If you weren’t able to get your hands on one, at least you can set it as your desktop background. This poster makes us wish Lundgren was making a bigger comeback alongside his fellow aging action stars Stallone and Arnold Schwarzenegger. Those two are pushing 68 and 67, respectively, and they’re still involved in massive franchises. Stallone is working towards another Rambo movie and the Rocky spin-off, Creed, while Schwarzenegger is back in full force as the Terminator in a new trilogy. What has Lundgren been up to? Though we saw him in The Expendables 3, he’s been keeping under the radar with limited-released films. The 57-year-old Lundgren has a few more of those down the 2015 pipeline -- War Pigs with Mickey Rourke, Four Towers with martial arts master Scott Adkins, and something called Shark Lake, which we definitely want to see. But there’s no reason he shouldn’t have a more explosive comeback, not when we’re already so inspired by this Rocky IV poster. Never forget: "Whatever he hits, he destroys." He was the complete antithesis, the opposite of what I was looking for. Then I thought, ‘Alright, why don’t we move it into more of the sci-fi, that he’s the man of the future?’ ‘Cause he was! He was just so big and tall and well built. He’s one of these guys that I had to keep out of the sun because he kept looking more and more defined. It’s crazy to think that Lundgren wasn’t what Stallone was originally looking for, which was more of a hulking, hairy beast of a man. Whoever that guy could’ve been, though, chances are he wouldn’t have looked nearly as good as Lundgren on this poster.